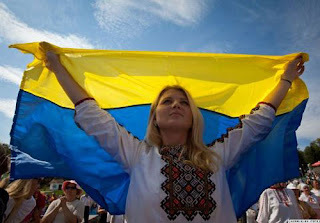 Today August 24, 2012, Ukraine is celebrating the 21st Independence Day. Recall that on August 24, 1991 the Verkhovna Rada (parliament) of Ukraine adopted the Act of Independence of Ukraine and the government finally withdrew from the Union of Soviet Socialist Republics (USSR). However, initially established Independence Day on July 16, since that day in 1990, Verkhovna Rada of Ukrainian SSR adopted the Declaration of State Sovereignty of Ukraine. His document was signed by First Deputy Chairman of Verkhovna Rada Ivan Plushch. According to the Declaration, Ukraine proclaimed a sovereign state, which claims supremacy, independence and indivisibility of power in its territory. Since the adoption of the document on behalf of the people could act solely Verkhovna Rada of Ukraine, and the territory of Ukraine within the existing boundaries proclaimed inviolable. Date of adoption of the Declaration of Independence was declared Day of Ukraine. December 1, 1991 in a referendum 90% of Ukrainians voted for independence of Ukraine. In the period from 1989 to 1991, almost all the republics of the USSR adopted the Declaration of State Sovereignty. In March 1991, the Union held a referendum in which the majority of the population voted for the preservation of the USSR. However, Lithuania, Estonia, Latvia, Georgia, Moldova and Armenia, which at that time declared their independence or transition to independence, did not participate in the referendum. By a vote of 20 August 1991 it was planned to sign a new union of sovereign states. The day before that date, some government officials have tried a coup and return power to the Communist Political Party of the Soviet Union. However, the event known as the Emergency Committee, have failed. And on December 8, 1991 in the Belovezhskaya Pushcha (dense forest) leaders of the three republics - Ukraine, Russia and Belarus - signed an agreement that finalized the collapse of the USSR.